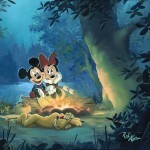 View cart “Family Campout Mickey, Minnie, and Pluto Treasures on Canvas by Rob Kaz” has been added to your cart. 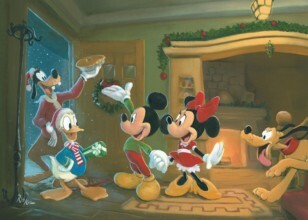 In Home for the Holidays, Goofy and Donald pay a visit to Mickey, Minnie and Pluto in this sweet Christmas-themed painting by Rob Kaz. 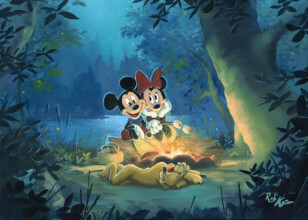 Using his experience as a character and background artist for Disney, Rob Kaz hopes his use of potent colors and engaging light are vessels that will bring you into the atmosphere of his paintings and leave your spirit wanting to stay. "I want you to long to be in the painting," says Kaz, "To take comfort and smile with a sense of whimsy, a sentiment in my paintings that can be contributed to my influential background in professional studio animation and video game art." He approaches each painting with a conscious sense of balance between earth and water - most of his paintings have water even if its existence is only implied. "I find natural beauty and a soothing logic in water that meets land that I hope relates as emotions, even if not parallel to my own," he says. The signature is always the most complicated part of any painting for Kaz because, "I find it extremely difficult to ever call a painting complete. But if you view my painting and find yourself there leaned against a palm on the shore while your mind authors a light rain or a curious butterfly taking flight, then I suppose a painting is never quite complete." 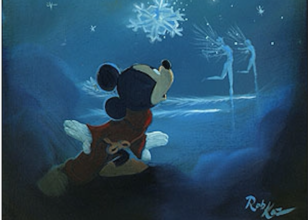 Following graduation from University of Central Florida, Rob began working for a number of small animation studios. 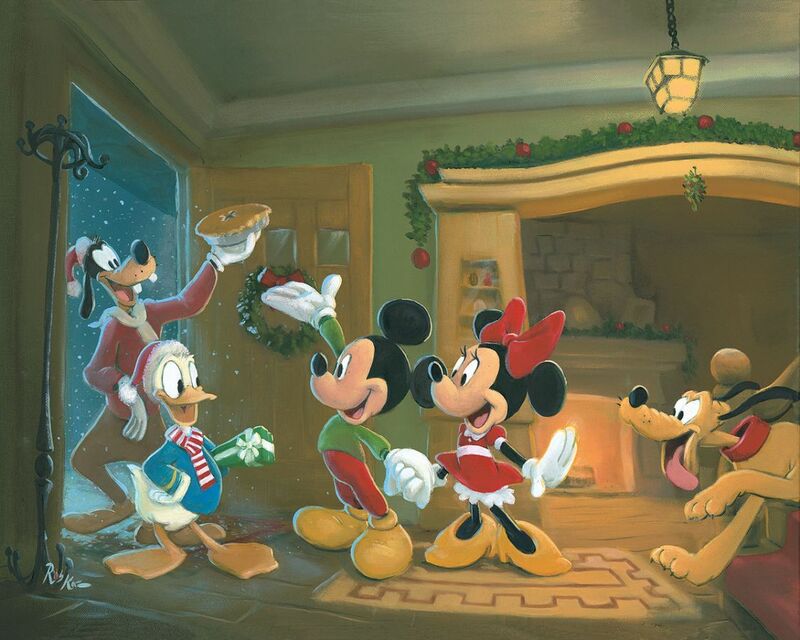 At that time, Disney had recently relocated their Florida-based animation studios to California which left behind many animators in Central Florida who chose not to uproot. As a result, Rob found himself working "alongside quite possibly the most talented artists I've ever known, right there in those small studios. Their influence was invaluable." While working alongside other world class artists, Rob had the opportunity to work in many areas of film. In particular, the time spent in character creation and environments heavily influenced his painting style. For some time, Rob worked as a character artist for Electronic Arts (EA Tiburon) creating human likenesses in games such as Madden and NCAA football. When Rob paints, he imagines "places he'd rather be" and he imagines "friends along the way", both of which are themes that reoccur naturally throughout Rob Kaz’s body of work. In most cases, his paintings include one or the other (and sometimes both). Today, Rob's work is a mirror of his background in animation. 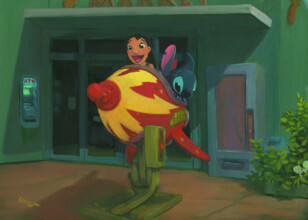 "I am one of the biggest fans of animation art you'll meet and being able to paint Disney is really an honor," he says. "I have had the privilege of working with many Disney artists and they inspired me to make the transition from animation to fine art. I want artists and fans alike to enjoy how I try to expand on the movies and add something more from my perspective."